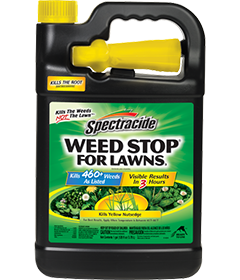 Enjoy a beautiful lawn with the Spectracide Weed Stop For Lawns (Ready-to-Use) it delivers results in hours. Some hard-to-kill weeds may require re-treatment. Do not apply when daytime temperatures are above 85°F as lawn injury can occur. Do not water treated area within six hours after application or apply if rain is expected that day. Pesticide Disposal and Container Handling: If empty: Nonreﬁllable container. Do not reuse or reﬁll this container. Place in trash or offer for recycling, if available. If partly filled: Call your local solid waste agency for disposal instructions. Never place unused product down any indoor or outdoor drain. This pesticide is toxic to ﬁsh and aquatic invertebrates and may adversely affect non-target plants. To protect the environment, do not allow pesticide to enter or run off into storm drains, drainage ditches, gutters or surface waters. 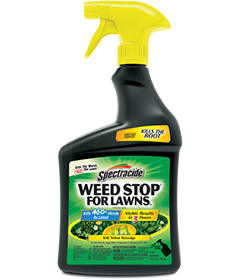 Applying this product in calm weather when rain is not predicted for the next 24 hours will help to ensure that wind or rain does not blow or wash pesticide off the treatment area. This chemical has properties and characteristics associated with chemicals detected in groundwater. The use of this chemical in areas where soils are permeable, particularly where the water table is shallow, may result in groundwater contamination. Application around a cistern or well may result in contamination of drinking water or groundwater.